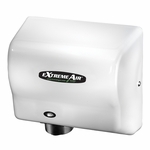 Bobkrick B-66997 Surface-Mounted Single Roll Toilet Tissue Dispenser with Hood. Satin-finished stainless steel. Hood protects paper. Chrome-plated plastic spindle holds rolls up to 5-1/8" (130mm) dia. (1500 sheets). Theft-Resistant Spindle (Part No. 283-604) available as replacement part.